No matter what pressure washer brand you decide to purchase, you are still part of the AaLadin experience. Why? Because AaLadin pioneered so many of the features other manufacturers have adopted. Of course, if you want the best features right now, you’ll find them first at AaLadin. We don’t claim to be smarter than everyone else. Our secret is simply that we listen to what our dealers and their customers tell us. Then we try to create a better pressure washer to meet their needs. So, our best ideas aren’t really ours – they’re yours – the difference is that we bother to listen, then create – that’s our secret to innovation. Choosing the brand – it makes a difference…. Every pressure washer manufacturer is going to tell you they make a good product. So do we. The difference is that we back that claim everyday. Again, this may not make a difference to you…but we feel it should. AaLadin really is different, better. When you consider our rigorous testing, maintenance friendly design, and United States technical support, AaLadin makes the equipment that makes sense for you. Use the drop down menus below to select the features most important to you, and we will suggest some AaLadin pressure washers that will meet your needs. 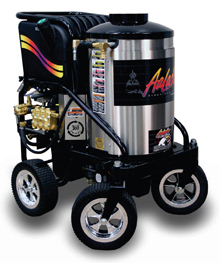 Find the right AaLadin Pressure Washer for you!